The University of Dayton and Grandview Medical Center have partnered to offer a culinary medicine program that teaches doctors healthy diet and cooking skills they can pass onto their patients. 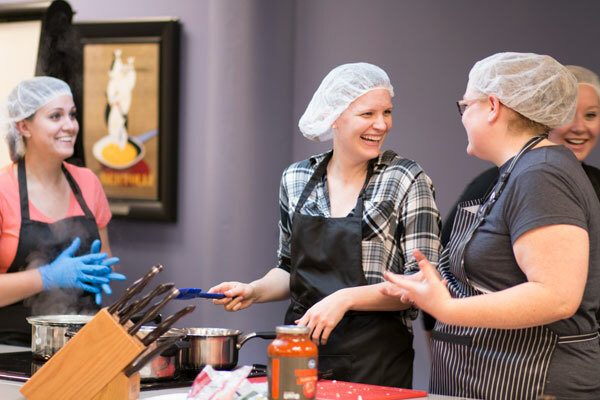 The program brings together primary care residents from Grandview and undergraduate dietetics students from the University for hands-on training preparing nutritious meals in the University’s ProduceOne Food & Nutrition Laboratory. Dr. Josephine Elrod, a family medical physician affiliated with Grandview Medical Center, said she saw the need for the program when she decided to focus her practice on rising health challenges, such as obesity, diabetes and heart disease. Elrod said culinary medicine uses food in addition to traditional medicine to treat and prevent disease. Each session of the program examines a case study related to a disease, such as hypertension, and diet choices that affect it. Sessions also address issues faced by patients that lead to poor food choices, such as having limited time, money and access to healthy food in Dayton’s food desert. The culinary medicine program is funded by Grandview Hospital Foundation, and is modeled after Tulane University’s teaching kitchen, which was the first to be implemented at a medical school. “We are excited to be the leaders in Ohio and the Midwest,” Elrod said.